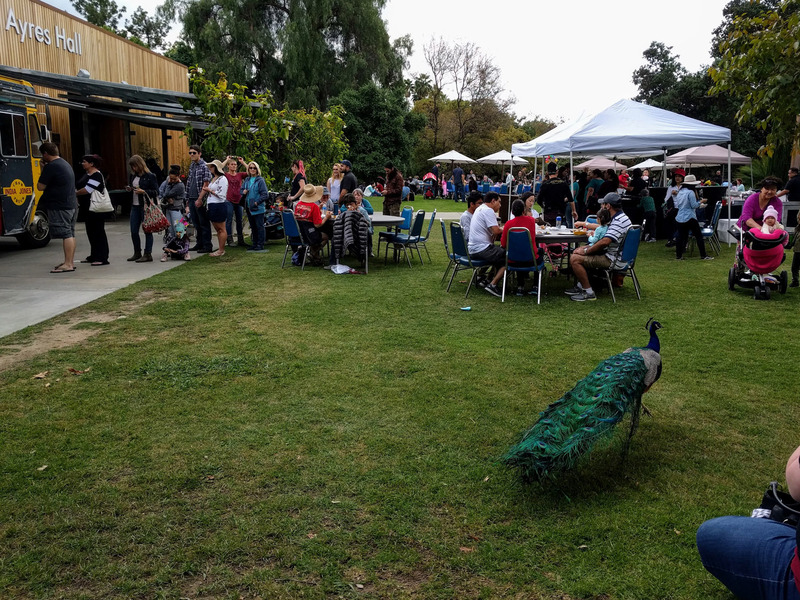 Saturday, March 25 was Peacock Day at the Los Angeles Arboretum. I was looking forward to giving a talk at this event for months because it was a chance to return to my stomping grounds at the best time of year. The event had guided peacock walks, peacock-themed art activities, sitar music, and an Indian food truck (because the species is originally from India). It was a hit – when I arrived in the afternoon there was a huge lineup at the park gates. 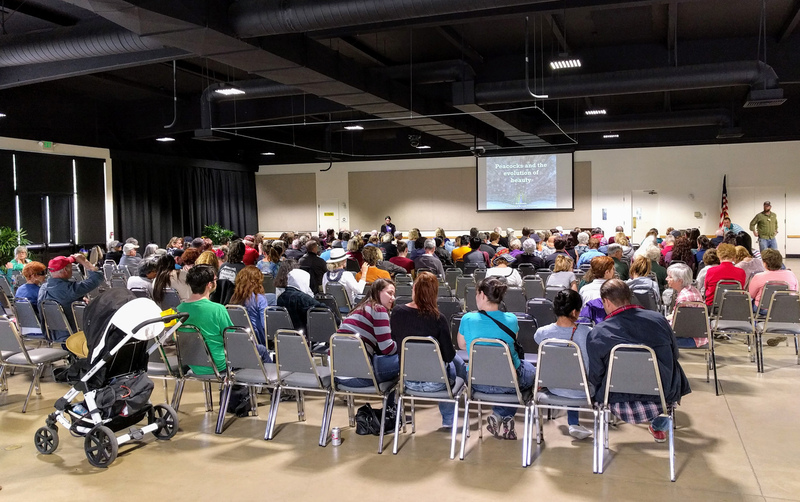 Total attendance was over 4,400, the biggest day of the year for the Arboretum. There was even a bump in attendance the following day (2,800), because of people who missed the peacocks on Saturday. My talk was in Ayres Hall (the same building we used to trap many of the females 7 years ago), with 170 people in the audience. I suggested that if we want to give credit where credit is due, we should really call it Peahen Day, because peahens are responsible for the evolution of the peacock’s amazing display. I also talked about why I think the species does so well in California (and other places). I think it’s because peafowl are social (they stick together as an effective defense against most predators), because they are quick learners, and because the chicks spend a long period of time following mom – around 9 months, actually. That’s a long time for a bird! It provides many opportunities for mom to transmit skills that allow her offspring to handle new environments, like what to eat, how to hide, and even how to cross the road. I think the main thing we’ve learned from our research on peafowl is the importance of dynamic signals during mate choice. 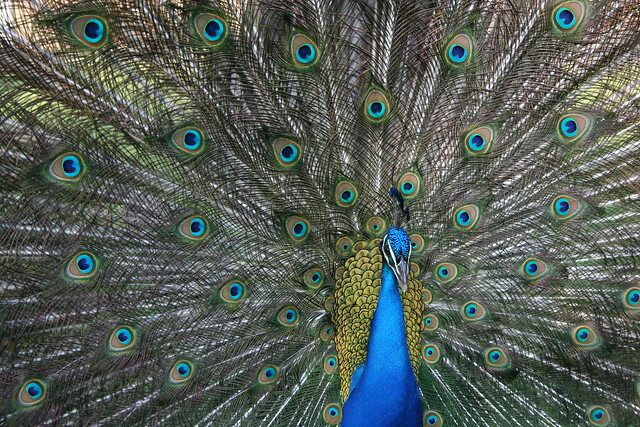 i.e., it’s not just what a peacock has that makes him beautiful, but also how he uses it. A major theme in evolution research today is whether sexual selection speeds or hinders adaptation. Although we don’t yet know whether sexual selection has promoted adaptation in peafowl, we can say that they have spread around the world because of their sexually-selected traits. 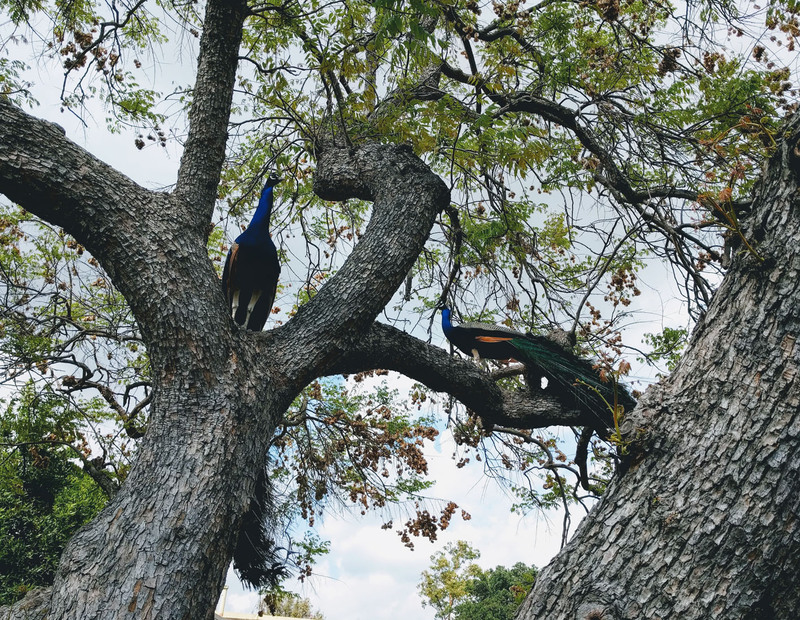 We brought peacocks to California, Hawaii, Florida, New Zealand, and many other places, because they are beautiful in our eyes as well as those of the peahen. Drones of the future are going to get a lot more maneuverable. A group at Imperial College London has now built an aquatic diving drone with wings that can tuck in for protection during rapid plunges, inspired by the hunting behaviour of seabirds in the family Sulidae (gannets and boobies). And a Swiss team has developed a drone with feather-like elements that allow the wing to fold into a range of configurations, analogous to the way birds can overlap their wing feathers. This allows the drone’s wings to be adjusted to suit the conditions – reducing wing area in strong winds, for example. These advances should make it possible for drones to maneuver in a greater range of tough-to-access environments, just like birds. Siddall et al. Wind and water tunnel testing of a morphing aquatic micro air vehicle. Di Luca et al. Bioinspired morphing wings for extended flight envelope and roll control of small drones. We have a new paper out! In this study we describe the rapid feather vibrations that peacocks use during courtship. These vibrations – at a rate of about 26 Hz on average – represent a substantial mechanical and metabolic challenge for the birds, especially given that they are performed using a massive array of feathers with widely varying lengths. A peacock shows his stuff. His train feathers range from 10 cm to > 150 cm in length, and the whole thing weighs about 300 g. Photo by Roslyn Dakin. We recorded high speed videos of peacocks displaying in the field. We also used lab experiments to test whether the peacocks move their feathers at resonance (which would be an efficient strategy), and to understand how the colourful eyespots can remain so steady during these vibrations. One surprising result was that the peacocks with the longest trains actually used slightly higher vibration frequencies overall – making their displays a greater challenge to perform. The next step is to understand how these feather motions influence the iridescent colour patterns as viewed by the peahens (the females), and ultimately, the hens’ choice of a mate. …and Suzanne reports that her husband met a couple in the Netherlands who had just read about our study in that newspaper. Pretty gratifying to hear that! The videos associated with the paper are available here. Like most ideas, this one arrived in the shower. 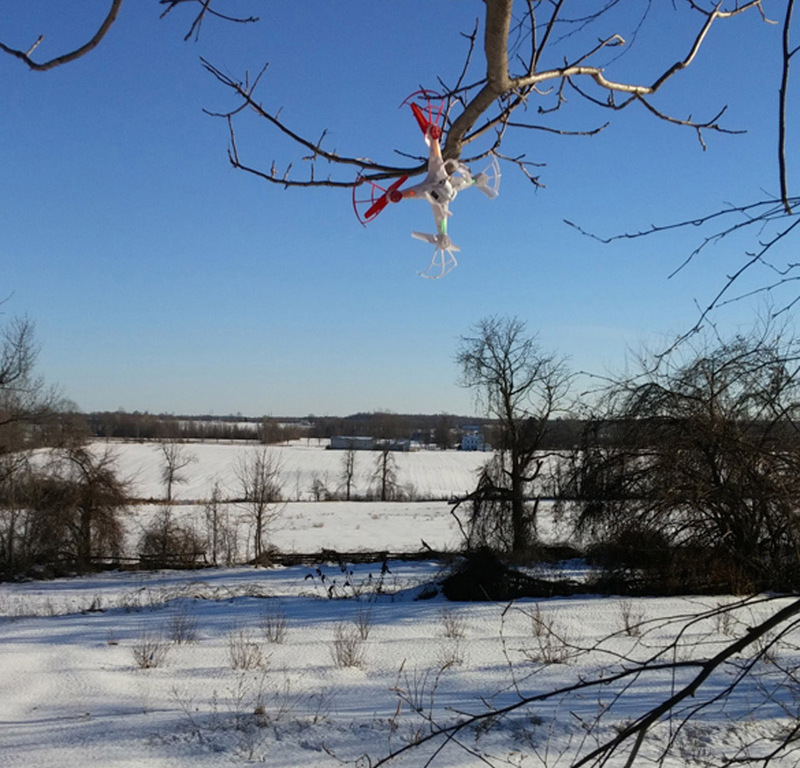 I needed to write a post for this week, but my list of topics was wearing thin and the weather is finally starting to get nice enough to distract me. Sure, I had a few promising ideas lined up, but they all need more time to develop. Plus I had a DVD to watch: a Nature of Things episode on serendipity in science due back at the library. Then it hit me – of course! I’ll watch the episode and then write about that. Serendipity – supposedly one of the top ten most untranslatable words in the English language – was coined in the 1700s by Horace Walpole as a play on the tile of a Persian fairy tale. The Three Princes of Serendip takes place in Sri Lanka. It follows the adventures of three brothers exiled from the island by their father the king, in hopes that his sons might achieve a more worldly education. In the course of their travels, the princes go on to solve many mysteries – like unintentionally tracking down a lost camel on scant evidence – thanks to their sagacity and a series of lucky accidents. Since Walpole, the word has taken on a close association with Eureka moments in science, starting with Archimedes’ famous bath. Supposedly, the ancient Greek mathematician solved the problem of measuring the volume of irregular objects after noticing how his own body displaced water in the tub. Scientists have taken a great interest in tracking serendipity, perhaps because it seems to play a role in research success. Wikipedia has an extensive list of celebrated examples, from Viagra to chocolate chip cookies. Many have looked for ways to encourage this kind of scholarly luck. For instance, after his Nobel prize winning work on viruses, the molecular biologist Max Delbrück is perhaps best known for coming up with the principle of limited sloppiness: researchers should be careless enough that unexpected things can happen, but not so sloppy that they can’t reproduce them when they do. Alexander Fleming had this advantage when he discovered penicillin. He first noticed its antibiotic effects in a stack of dirty culture dishes that he hadn’t bothered to clean before leaving for summer vacation. So how do people study something that is by definition rare and unusual? Psychology Today has summed up some of the latest research on luck, most of it based on surveys of people who claim to be especially serendipitous1. Not surprisingly, they are more competent, confident and willing to take risks than the rest of us. They are also more extroverted and less neurotic than most. Being born in the summer apparently helps as well – especially May. Other advice might be more practical.